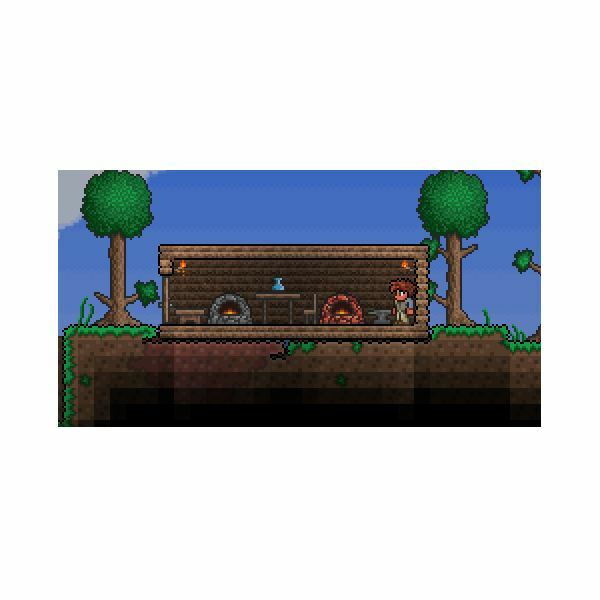 Terraria's crafting system is rather simple and easy to understand. 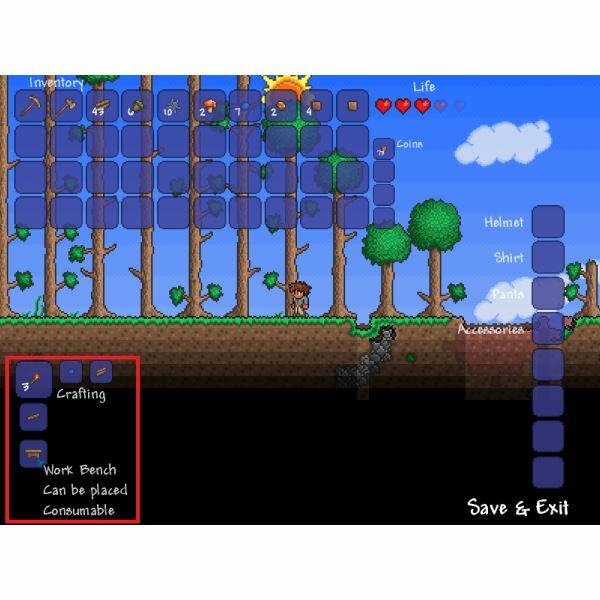 Unlike that other game about exploring a world and collecting resources to build things, Terraria isn't about taking the proper components and then arranging them in the proper pattern. Instead, you pick what you want to build from a list, which you access by pressing the ESC button. What you can make at any time is based on two conditions. The first is the resources you have in your inventory. For example, you need wood to make a wooden hammer, so you will not be able create one until you have chopped down a tree and obtained wood. The second condition is the crafting station you're nearby, if any. A station is a item you play in the game world that lets you create more complex items. For example, the workbench is required to make a wooden sword, and a furance is required to create the ore bars you need for many more complex items. Remember – it's about your resources, and where you use them. If you do not see an item available for crafting that you expected, it's probably because you either over estimated the resources you have available or you're not near the proper station. Items you cannot currently create do not show up in your list at all, so you know it's one of these two problems. As mentioned, you cannot make an item if you are not near the crafting station it requires. Here are the stations available, and the kinds of items they make available. Workstation – This requires 10 wood to build, and it makes a number of basic items available. You'll need this to create your first weapons and the building blocks of your first stuctures, like wooden doors and tables. Furnace – Created at the Workbench with 20 stone, 4 wood and 3 torches, this is likely the second station you'll build, the Furance is needed to create ore bars and bricks. These ore bars are then used to create more advanced equipment at other stations, while the bricks can be used to create structures. Iron Anvil – Created at the Workbench with 5 iron bars, the Iron Anvil is your main source of weapons and armor. Most of what you'll need in combat is created here. Alchemy Station – Place a bottle on a table and you have an alchemy station! This lets you create potions which will restore you health and mana. In addition to these stations, there are two that are found only in dungeons and have limited uses. Hellforge – Used to create Hellstone Bars, which are needed to make some high-end weapons and armor. Demon Altar – Used to summon bosses by placing approriate items. This is all the basics you need to know to start making important items in Terraria. It's not that complex, and you'll find that the difficulity is usually found in the process of acquiring items rather than actually making them. For more information about all of the specific items in the game (there are hundreds) check out the Terraria Wiki.